Turn 21. I killed the gorgon. I went blind. Ermor removed from game. Turn 21. I killed the gorgon. I went blind (the blind sc isn't that bad because i can strip his items and get 6rp a turn forever from him). There is a very small army in 320 so i assume atul won in 329? pythium is now assaulting me from the east, shinyuma is swinging around to assault me from the south, and pythium is bordering my capital in the north, and pangaea may or may not be able to beat me in the east... but the gorgon is dead at least!!! and my sc routed afterwards because blind he couldn't kill barbarians... so no magic duel related death so i can transfer the items..
the pythium army has like 50elite calavry and 12astral mages in communion... the shinyuma army i didn't see this turn... the barbarians don't have much mage support. forging another dhammer this turn... i have another dhammer to send out this turn.. drp already has two.. maybe i should send atul one? Re: Turn 21. I killed the gorgon. I went blind. Ermor removed from game. So long guys, and good luck. I killed most of C'tis troops in the storming, but in the end it came down to a battle of skelly spammers, and he had more than I did. I took Jotunheim's capital. 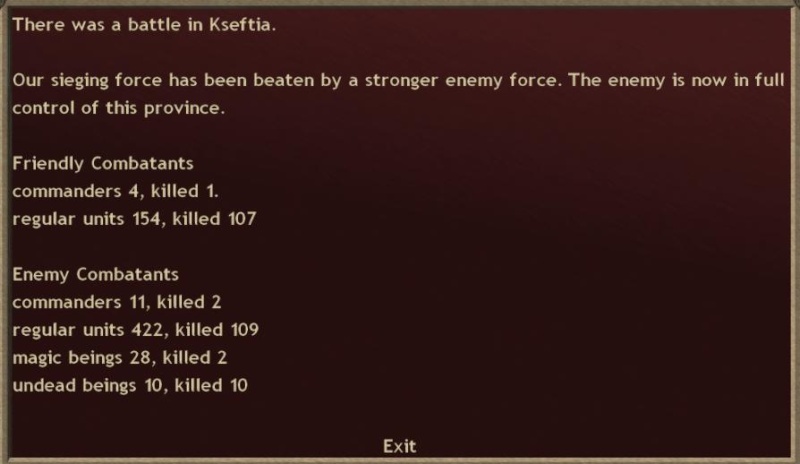 He managed to get neighbouring province with sneaking troops so not a total success (especially since I just managed to auspex two air sites from there, apparently even good ones as Jotun's gem count went up even when losing his capital, grumble). Attacking Jotunheim at 42. My pretender got attacked by a Horror, but it didn't hit him so horror mark level is hopefully still in manageable levels. After discussion with namad, cloud trapezing him to 302. There's a big communion army from Pythium, just hoping my Grip of Winter manages to do some damage to mages in the back too. Forging 2 brands and 2 shields of gleaming gold, so I'm in the raiding business next turn too, yay. Attacking Caelum into 40 too. Well a pretty bad turn for me. A little seeking arrow spam messed up my attack on Machaka, I lost half my army, and I'm not sure I would have won regardless. I have a 2nd harbinger now that I'm going to use for battlefield enchantments. Gear for him would be nice but isn't necessary (fire brand, rainbow armor, horror helm). A pair of Messenger Boots or Birch Boots would be great for my first Harbinger. On the positive side I dropped on an Arco army of 136, killed half of it, and didn't die to its 10-mage communion group. Maybe I can do the same to the larger army. If any of you have insights as to where Arco's army is headed next, I'd love to hear them. I don't want to fight him in the swamp, and so far he's only been concerned with reclaiming territory. So I'm going to raid this turn, and hopefully be able to place myself in his way next turn. 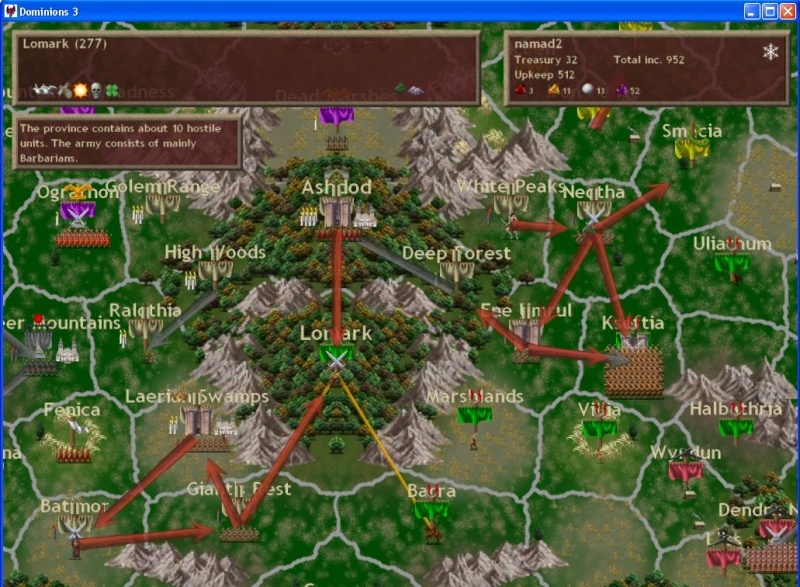 Let me know if anyone sees some tactically important low-pd 0troop provinces... i can use arouse hunger... i can't really use it against any of my own enemies because i'm surrounded on all sides by large armies and high pd... but i can cast this spell once or twice per turn and it's a decent deal if it works and helps someone. If I could get word on if or when I am getting gear, it would greatly help me plan the next few turns. None of this is critical in any way, I can use my 2nd harbinger equally well as mage support, and the first one has just enough reinvig as-is. If I'm not getting gear, that's how I'll use them. But if I am getting gear, my strategy shifts to one that depends on premature routs and cutting retreats and calling in friendly thug strikes, which is a quite a lot different. And since I'm lab-dependent, not just with equipment, but also gatewaying around my troops, I need to know these things in advance so I can get everyone in position. TheDemon, I'm forging you a fire brand this turn, sending it next. If needed, I can forge/send a luck pendant and a shield of gleaming gold too. Luck pendant costs only RPs, shield goes out of my thug equipment quota (low on gems as we all). I don't have access to nature stuff. On a more general note, I'm participating in the local yearly RPG/boardgame/larp/wargame convention on next weekend. It's close to my home so I'm able to do my turns but communication will be intermittent. So, next turn's info and requests might be short. Preparing to fight massive Agartha army in 224? We'll see how that goes, I have a mighty communion which is a good start. If he has darkness up I'm toast, though. Gathering army in 209 to attack 205 next turn? Hopefully I don't hit a counterstrike from Baalz/Eriu. Making a SoGG, rainbow armour and birch boots, some ice brands and a master matrix. Sorry, TheDemon, can't make you a fire brand. Serious need for more fire, earth, nature to keep forging.